A healthy fast food initiative aimed at getting young people to improve their diets has been launched in a bid to tackle obesity in low-income areas. Four mobile fast food units selling a range of healthy burgers, chicken and wraps have set up near schools in four east and north London boroughs in the hope students will take to the food on offer. 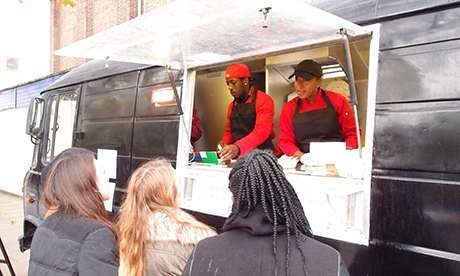 A van selling low-fat and low-salt Caribbean chicken burgers began a six-month trial last week near Haggerston School as well as healthy pasta meals and stews. Each vendor took part in tests to ensure their food’s salt, fat and sugar content met national health guidelines. The organisation behind the idea, Shift Design, said previous child obesity strategies that advised young people what to eat had failed. Eating at takeaways was a social activity for teenagers and venues were chosen due to their convenient location, tasty food and price, a spokesperson said. It is hoped that by positioning healthy, but tasty and cheap fast food units close to schools unannounced, students will use them voluntarily without feeling they are being told what to do. If the programme proves successful Hackney Council said it would look at implementing it across the borough where more than 40 per cent of children are already overweight or obese by the time they leave primary school, according to a council report citing figures from 2011. The six-month trials follow a successful pilot in Newham last year with a healthy chicken and chips stall proving popular with students and young people. The number of chicken and chip shops has become a matter of concern for public health officials particularly in low-income areas. There were 163 shops selling fried chicken in Hackney in 2010, according to the council in a Freedom of Information response. Meals with a drink are offered for as little as £1.50. Research carried out in the USA found that a fast food outlet within 160m of a school contributes to at least a five per cent increase in obesity rates among 15 to 16-year-olds, a Hackney Council spokesperson said. The Council already blocks new fast food shops from opening within 500m of secondary schools, but there is little it can do to closedown existing ones without changes to planning legislation. Councillors opted last year not to introduce the same measure for primary schools that would have effectively prevented any new fast food shops opening up in the borough. Bobby Callender, who owns the Riojaes Caribbean food van parked near Haggerston School, said the problem is that most fast food shop owners have little knowledge about health and nutrition and are only interested in maximising profits. Yewande Ogunjimi, a six-former at Haggerston School, said she could taste the difference between one of Bobby’s Jerk Chicken burgers and a regular takeaway. Cllr Jonathan McShane, Cabinet Member for Health, Social Care and Culture, said: “Reducing childhood obesity rates is a public health priority in Hackney and we’re always looking at ways of expanding our broad range of initiatives to improve the diets of young people. Riojaes Caribbean street food van can be found on Scawfell Street near to the junction of Hackney Road from Monday to Friday during school hours.